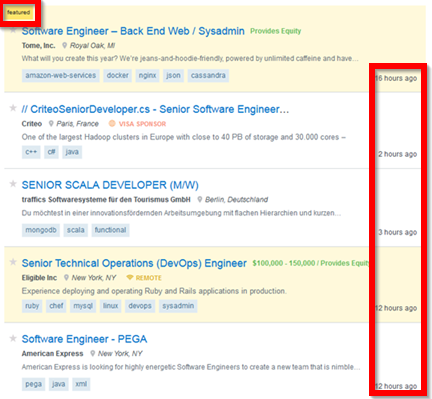 It appears that I have two options to filters jobs: Matches and Most Recent. If I select "Most Recent", it sort mostly by the newest first. The very first posting is not the most recent, but it is featured, so I assume that's intentional. 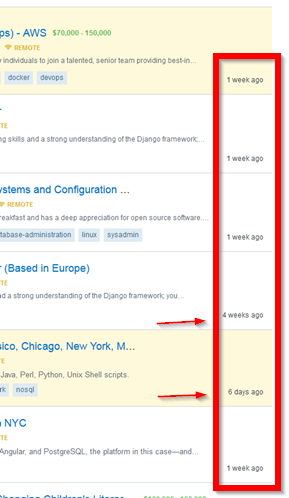 However, if I search by "Matches", the job posting times are ordered more randomly. In this search, we have posts that are a week old, then a month, then 6 days, then a week. If I keep scrolling I have 2 weeks, 3 weeks, 2 weeks, 1 week. How do I order by matches by newest? This sort order makes no sense. Why is something that was posted yesterday second to last? Why are listings that are hours old scattered in the first few results and why do I have 4 week old listings bumping things that are newer? The usability for finding matches isn't helpful if it's showing me older results that I've (presumably seen already) before brand new matches. Matches is a recommendation algorithm where one of the features included is recency (other features include your personalized prediction data, and tags from your CV). There is no newest sort available for the matches tab. If it's new and relevant, then it will surface towards the top. Also your assumption is correct on the "most recent" tab. That's by design. Edit: We will be taking into consideration adding a sort order to the matches tab.